Oftentimes in the Bay Area, the weather doesn’t match up well with the season. Such as it was on November 1, 2011, when I made this soup. It was balmy, high 70s, no wind but I still wanted a winter soup. I couldn’t help myself. So here it is as we head into a weekend that promises to be rainy and chilly. Enjoy! You can use any pinto, borlotti-like, or cannellini beans you want, and you can also play fast and loose with the sausage, even going so far as to use sausage in casings or lamb merguez or something like that. I happen to have used Rancho Gordo Good Mother Stallard beans and spicy, loose Italian pork sausage from Bi-Rite market. It was good, simple, and comforting, even on a warm day. Soak the beans for several hours or overnight. When the beans are nearly done, brown the sausage, breaking it up into smaller pieces with a wooden spoon. Drain the fat. When the beans are tender, but still firm, add the drained sausage, kale, potatoes, and any other vegetables you want to use to the bean pot. Add 2 to 3 cups of chicken or vegetable broth to desired consistency. Bring to a simmer, and add salt and pepper to taste. Cook until vegetables are tender and flavors meld, about 20 minutes. Correct seasonings. This soup will be even better the next day. 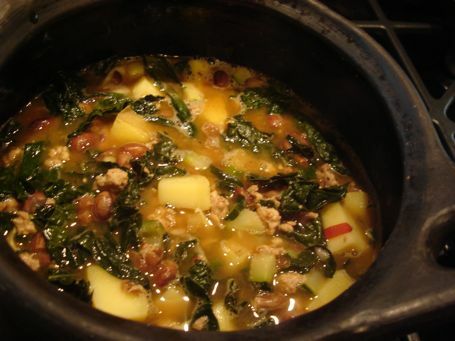 This entry was posted in from the market, hearty and tagged bean and kale soup, bean soup with sausage, bean soups, Bi-Rite, potato and kale soup, Rancho Gordo, winter soups. Bookmark the permalink. Post a comment or leave a trackback: Trackback URL.